As I sit down to collect my thoughts, I am randomly recalling that scene in Willy Wonka and the Chocolate Factory (one of my favorite childhood films) where Mr. Wonka proclaims, “So much time and so little to do. Wait a minute. Strike that. Reverse it. Thank you.” This is precisely how I feel about my life–last week I moved into a new home, further North of San Diego, which of course brought its own set of chaos and disorder, but I have finally settled in and even amongst my huge transition, I have still been able to enrich my inner-child and I must say, starting this new chapter already feels amazing. Last week I was able to participate in something super magical, and better yet, I was able to share this exercise with someone who I am currently coaching. Since last Thursday marked a beautiful full moon, I took advantage of the Universal energy and challenged not only my client, but myself to search deep for beliefs, thoughts and feelings that I am still clinging to, that must be released. 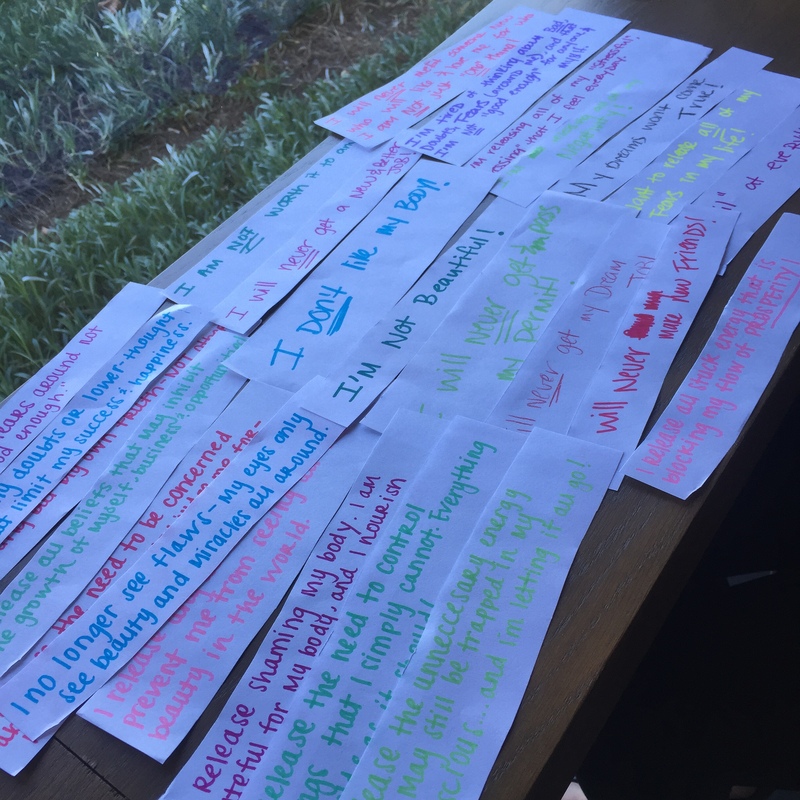 When I mentioned this exercise to my client, I wasn’t anticipating how fully prepared she was to really relinquish these beliefs she has grown tired of submitting to, and when she and I got together she had already accumulated over 60 statements that she was willing, ready and able to release! This is a testament to how powerful conscious deliberation is–once we actually address the emotions and belief patterns we have welcomed into our minds and thoughts, we are empowered enough to let them go, just as easily as we allowed to let them in. And this all occurs through a decisive and conscious mindset. I am not worth it to anyone. I release shaming my body; I am grateful for my body and I nourish her with compassion and grace. I release all fears around not being good enough. I will never make new friends. And might I add, this wasn’t anywhere close to being the best part. Afterwards, we sat down at a park, read each statement to one another and to honor our truth and intention, we released all negativity by tearing the paper and through this symbolical representation, releasing ourselves from every little thing that is no longer serving us. And although my client and I made this a little fun by bringing out the markers and sitting down at a coffee shop working on this together, releasing yourself from the chains of negativity and attachment doesn’t require fancy crafts, a full moon, or even a piece of paper. Being released is an inner process, guided by your conscious of course, where again, YOU are empowered enough to say “enough” and dismiss anything and everything that doesn’t belong in your space! I shared with a close friend of mine how powerfully vulnerable this moment was–regardless of where you are on your journey, development and growth is still imperative. When you think you’ve released all you have, dig deeper. I guarantee there’s even more lingering around to uncover and finally cut all ties with. I hope this is a month that brings forth emotional and physical releasing on your part, and I can’t wait to hear about all that exits the perimeters of your mind, leaving room for only things that serve you for the highest and best of all good concerned.